Where Can I Buy Grey PVC Tablecloths? There can only be one response to this and that is here at Jolee Tablecloths. We know how popular grey is for wipe clean tablecloths. Grey slots in perfectly as a neutral colour so you can be assured it won't take over your room. We have an extensive range of grey PVC wipe clean tablecloths in stock and ready for immediate dispatch. Whether you are searching for plain grey PVC tablecloth, grey glitter PVC tablecloth, grey dotty PVC tablecloth or perhaps a grey check PVC tablecloth, this is the place. 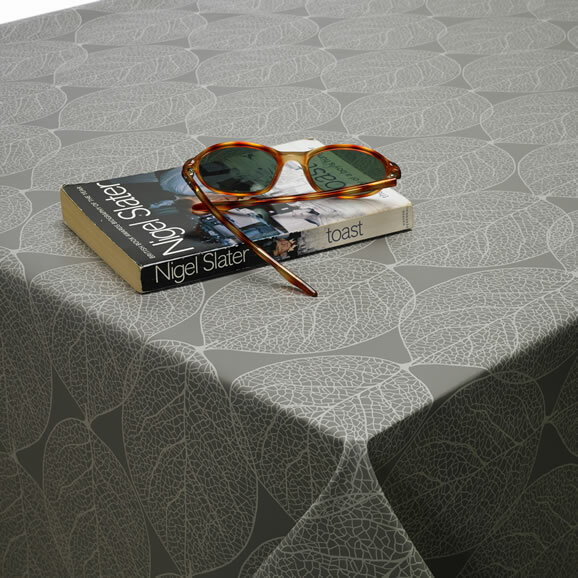 If our grey PVC wipe clean tablecloths aren't to your taste, then don't forget we also stock grey oilcloth tablecloth and grey acrylic tablecloth. The standard width of a PVC Wipe Clean Tablecloth is 140cm (55 inches) however we understand that one size doesn't fit all which is why we offer a bespoke service for extra-wide tablecloths. By sewing two widths together we can give a desired size between 150cm and 260cm wide, this is the same for round tablecloths as well. We also offer other optional extra services such as bias-binding hemming, rounded corners and parasol holes for outdoor tables. All work is carried out in-house by our own seamstress and done to the highest standard including pattern matching. If you would like a quote for this please contact us and we will be happy to help.